Talking soil health on Bryan Biegler’s farm near Lake Wilson. On Thursday, despite rain and the threat of thunder, a group of farmers crowded around a pit dug in the midst of row crops almost ready to harvest. They were eager to hear about techniques to assure the health of the soil on their farms for generations to come. Two soil experts pointed out the layer-cake quality and texture found in healthy soil. University of Minnesota soil expert Jodi deJong-Hughes said wind erosion is a major enemy of soil health. She told the audience that soil particles that originated in western Minnesota and the Dakotas have been found in Central Park in New York City due to wind erosion. Some spots in North Dakota have lost 19 inches of topsoil due to wind erosion. 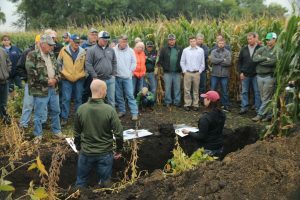 The good news is that farmers are developing tools to keep their rich, productive topsoil in place, she said at a field demonstration Sept. 15 at the farm of Bryan and Lauren Biegler in Lake Wilson. The Bieglers are one of 65 farm cooperators nationwide taking part in the Soil Health Partnership, an initiative of the National Corn Growers Association, to discover and foster best management practices for soil health. The Bieglers use cover crops and practice reduced tillage — both of which help build healthy structure and content in the soil and keep it in place. Bacteria, specifically of a type called actinomycetes, work together with plant roots to develop the aggregation — the clumpy structure of soil — that makes it an excellent medium for plant growth and helps keep soil particles in place. Reduced tillage helps microbes like actinomycetes flourish, which benefits the soil. Several dozen farmers turned out on a rainy afternoon to hear deJong-Hughes and Nick Goeser, the soil scientist who directs Soil Health Partnership. The farmer audience members also fired questions at the Bieglers to get the benefit of their experiences. Farmers favor peer learning situations because they offer the practical, real-world-tested experience of other farmers. Where soil structure has been damaged by tillage that is too aggressive for the soil type and landscape, farmers often find compacted soil, which can have an adverse affect on crop yields. Goeser pointed out the pores that could be seen at the bottom of the soil pit, channels deep through the soil profile, created by plant roots. Corn roots can make it through compaction, but it takes energy that could otherwise be devoted to creating plant mass and grain yield above ground level. That’s where cover crops offer a real assist, he said. The channels created by plants like tillage radish during the off season are exploited by the corn and soybean plants, so they can turn more of their growing power into yield. “How do you adjust tillage to get healthier soil?” one audience member asked. 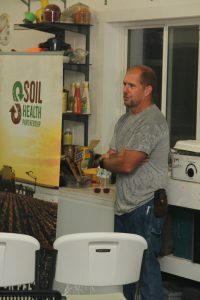 Bryan Biegler, the newest MCGA board member, recently hosted a soil health field day on his farm near Lake Wilson. She pointed out that different crops don’t necessarily need the same tillage. She finds the style of tillage practiced by the Bieglers, strip till, to be the best of both worlds. “You have full tillage in the middle where you are going to plant, and no till on the sides. You get the benefits (to soil structure) from the no-till and the benefits of warming the soil that tillage provides,” DeJong-Hughes said. Bryan Biegler said strip tillage has been a big plus for him in the four years he has been using it, because it makes planting easier and it saves money.